Corbyn words weighed on Sterling as he hinted stalemate negotiations with the government. UK March inflation updates to be out this Wednesday. The Sterling succumbed to discouraging Brexit-related headlines and a bout of dollar's demand during US trading hours, with the GBP/USD pair falling to 1.3042, its lowest for this week. The UK employment report was mixed but overall upbeat, as in the three months to February, the unemployment rate remained fell to 3.9% its lowest in almost five decades, while the number of people in work in the UK hit a record high, driven by more women finding jobs. Average hourly earnings were up as expected, rising by 3.4%. However, the Claimant Count Change in March resulted worse than expected, printing 28.3K against the 20.0K expected. The positive headline was offset by not that positive comments from Labour's leader Corbyn, who said that there's no agreement yet with PM May on a customs union, environment, and worker's rights, hinting that talks are going nowhere. The UK will release March CPI and PPI figures this Wednesday, with yearly inflation seen up to 2.0% YoY. The daily decline can also be attributed to bulls giving up after another failed attempt to push the pair beyond the 1.3100 level. 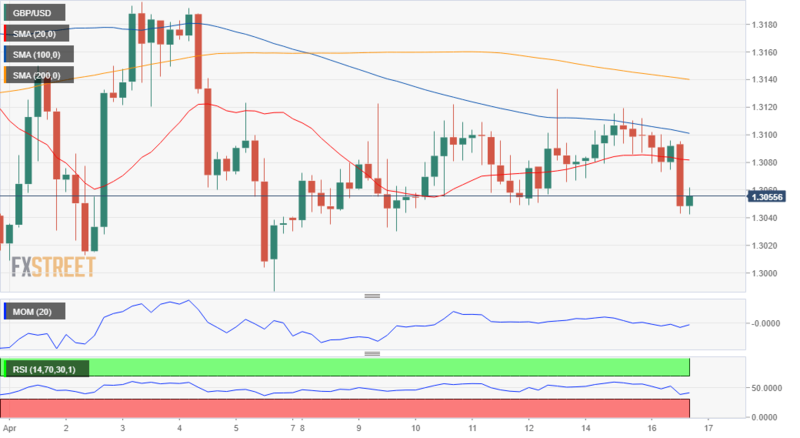 The 4 hours chart shows that the GBP/USD pair retreated further from the vicinity of a daily descendant trend line coming from the yearly high, now below the 200 EMA and the 20 SMA, this last gaining downward traction. The Momentum indicator in the mentioned chart heads sharply lower within negative levels, while the RSI is partially losing its downward strength but around 40, all of which skews the risk toward the downside.